The Africa’s Number one mobile phone maker, being one of the best customer-centric brands, gave back to the society through its numerous life-changing activities, such as the TECNO Light Your Dream, Camon Selfie King and Queen, various campus activities, thousands of giveaways on social media, and more recently the 24MPAIClearSelfie Challenge, TECNO MerryGiveMas Contest, and the new year Count Down Give-Away. 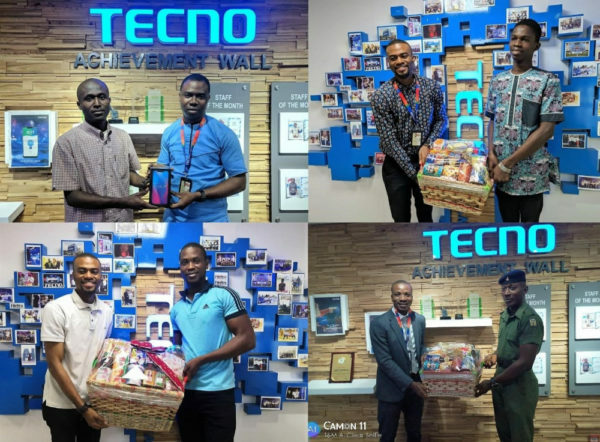 During the Christmas period, TECNO MerryGiveMas Contest, a 12-day event, was held every day from Friday, December 14th – Tuesday, December 25th, 2018. Many families who partook in the event were rewarded with the new Camon 11 Pro and hampers every day, from the first day to the last day of the contest. At the end of the activity, 3 winners smiled home with the new Camon 11 Pro while 9 people won hampers. To Learn more about giveaways and other exciting opportunities in 2019, Follow @TECNOMobileNG on Twitter and Instagram and @TECNOMobileNigeria on Facebook.